The provincial park at Rainbow Haven Beach can attract thousands of visitors on a hot summer day. The large sandy shore is beautiful and the cool water can be refreshing in the heat. A network of boardwalks leads to different sections of the beach, allowing visitors to walk among the grassed sand dunes without having to disturb the ecosystem. Parking lots fill quickly, so vehicles line the sides of nearby roads, where they are often ticketed if wheels are found touching the pavement. Lifeguards, washroomsand change rooms with an outdoor shower are all available throughout the summer months. Volleyball is a popular activity on the beach, attracting many young people. The numerous plastic toys that are left behind indicate the large number of children who are kept busy playing in the sand. Over the years I’ve noticed a decline in bird and marine life along this shore. Intensive human activity, even if it’s limited to a single season, has an effect on wildlife that cannot be denied. Plovers no longer nest in the grassed areas, which is probably just as well, since many dog owners ignore the signs that instruct them to keep their pets on a leash. 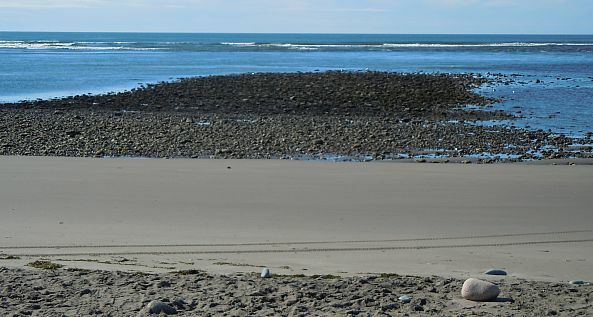 Sensitive sandpipers have moved further into the quieter watershed area behind the beach. Seashells have become more scarce over the years, as have the crabs and sea stars that were once common tidepool residents. Only seagulls remain, if they are present at all, lured by the garbage left behind by visitors. Wild Statice grows in the park. Sometimes called Sea Lavender, it will be a bright purple once it’s in full bloom. This plant is often used in both dried and fresh floral arrangements. It is illegal to remove plants or animals from a provincial park. Managing parklands in a way that allows people to enjoy nature while minimizing the negative effect on the ecosystem is an ongoing challenge. If you visit this beach, take care to leave with only your memories. Let only your footprints remain behind on the sand. For all posts about Rainbow Haven Beach see here. This post updated August 23, 2015. All text and photographs copyright Amy-Lynn Bell 2009 and 2015. That’s a big issue here, too. My theory is that the more parks and recreational sites we have, the more people can spread out and enjoy the resources without damaging them. As I walk the beaches of Grand Traverse Bay, I notice the change in flora and fauna, too. I wonder if there isn’t more going on than the pressure of summer crowds. Your theory sounds feasible to me Gerry. I think Canada can benefit from lessons learned by the more populated areas in the US as to how to manage public access to ocean and lakeshore resources. I too wondered if there wasn’t something ‘more’ affecting the growing absence of certain species. Some species do go through population cycles and may be affected greatly by small changes in their environment. The warming of the earth’s oceans is often given as a reason. Recently I’ve found that some of these species are still thriving nearby in areas that receive less human traffic. It may very well be a combination of factors.